Texting and Driving Accident Attorney | Simmons and Fletcher, P.C. Texting and driving is a major cause of automobile accidents in Texas. According the Texas Department of Transportation (TxDot), one out of every five car accidents is caused by distracted driving. In 2013, there were 94,213 auto collisions recorded by TxDOT that were caused by distracted drivers. As of September 1, 2017, Texas drivers are prohibited from reading, writing or sending an electronic message on a mobile/cellular device unless the vehicle is at a complete stop. At Simmons and Fletcher, P.C., our texting and driving accident lawyers are here help victims injured in crashes caused by distracted drivers. When people think of individuals who text and drive, they typically think of teenagers being the culprit. The reality is that cell phone use and texting while driving is an epidemic not limited to just teens. Distracted driving is a problem among young drivers, older drivers and even commercial motor vehicle operators. 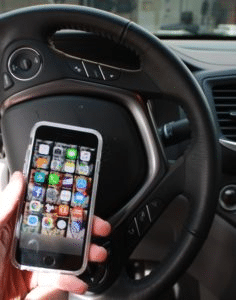 Due to the ever-increasing problem of accidents due to driver distraction from texting and other cell phone use while driving, it is now illegal in the State of Texas to send an electronic message on a cellular device while operating a motor vehicle unless it is hands-free or the vehicle is not moving. While the criminal fine if you get caught is not substantial, you could find yourself charged with manslaughter if you get into a wreck while texting and driving and negligently cause the death of someone in your vehicle or another vehicle. All of the above actions take a driver’s focus off the road reducing awareness and reaction time. Call Simmons and Fletcher, P.C. Drivers have a duty to maintain a proper lookout at all times while operating a motor vehicle. It only takes a split second for an accident to occur. If you believe you have been the victim of a texting and driving accident, call Simmons and Fletcher today. You may be entitled to compensation for your medical bills, lost wages, physical impairment, pain and suffering, scarring and even punitive damages. If you cannot come to us, we will send someone to you. Our texting and driving attorneys are here to help those injured by distracted drivers. What Should I Bring to the Meeting With My Attorney?